Samy Kibula’s aim to kick-on and gain more first-team matches for Wigan is so he can pay back the people who got him to where he is – his parents. 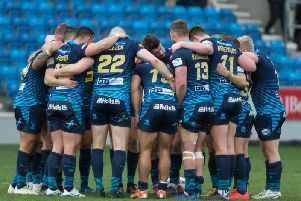 The 6’ 3 18-year-old made his Super League debut for the Warriors in last month’s 20-12 defeat to Huddersfield, though his contribution was a high point for fans in the otherwise disappointing match. Now Kibula has his eye on making a first-team slot his own, despite still being young enough to play for the under-19s, and he wants to use it as a ‘thank you’ for the time his parents gave up when he was rising through the ranks. “They’ve struggled for me to be in this position so me making my debut makes them very happy,” the ex-Leigh Miners amateur said. “They especially helped me when I was playing games, sometimes it was snowing, I played a bit of rugby union so all that was in winter, so snow, rain, horrible weather and getting up early mornings dropping me off. Kibula, who celebrates his 19th birthday next week, has a plan in place to make sure he enjoys more time in the first team next term. “It’s about making sure I’m good and fit in pre-season and impress the coach – hopefully I’ll get more chances,” he said. “I was very chuffed to make my debut, it’s something I’ve been looking forward to all my life. “It was a shame we didn’t get the result but now for me it’s building from that. Coach Shaun Wane will not be at the club to oversee Kibula’s development after handing him his debut. But the imposing forward has revealed Wane has briefed him on what he needs to do to make sure he gets more time on the field. “We both know there are things I need to improve on and things he is happy with, so it’s just improving everything and making sure I’m at my best,” he said, revealing the difference between first team and Academy training is minimal.